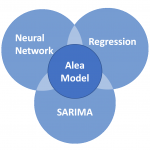 AleaSoft, October 11, 2018. The price of the electricity market of Spain and Portugal has fallen during the last week. 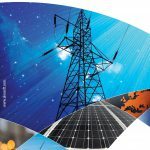 According to AleaSoft, a lower electrical demand, as well as the publication of the Royal Decree-Law 15/2018 that includes an exemption of the “green tax” and the temporary suspension of the 7% electricity generation tax, are the fundamental causes of this fall. During the last week, from Friday, October 5, the prices of the Spanish electricity market have fallen 3.30 €/MWh when compared to the average of the previous seven days. This fall coincides with the announcement and publication of the Royal Decree-Law 15/2018, from October 5, with urgent measures to lower the electricity bill. According to the analysis made by AleaSoft, the effect of the cited Royal Decree-Law, which includes the exemption of the “green tax” and the temporary suspension of the 7% electricity generation tax, together with a lower electricity demand in the last seven days are the fundamental causes of this price reduction, in a period when production with renewable, nuclear and hydroelectric energy in Spain has been lower than the previous week and when the production with gas combined cycles has increased. In this context, the price of the electricity market of Portugal has also fallen in the last seven days, in this case 2.80 €/MWh, which causes Spain to export electricity to Portugal. After the publication of the Royal Decree-Law, the Spanish combined cycles are being more competitive and are entering the market matching process displacing the combined cycles of Portugal. The futures of electricity of Spain and Portugal in the OMIP market have also fallen during the last week, mainly for the first quarter of 2019 (Q1-19) that in the session of yesterday, October 10, settled 2,08 €/MWh below the settlement price of October 3. In the case of year 2019 futures (YR-19), the fall was 0,62 €/MWh. For the rest of the European markets, the average price of the last seven days, from October 5, has increased, with exception of the N2EX British market. 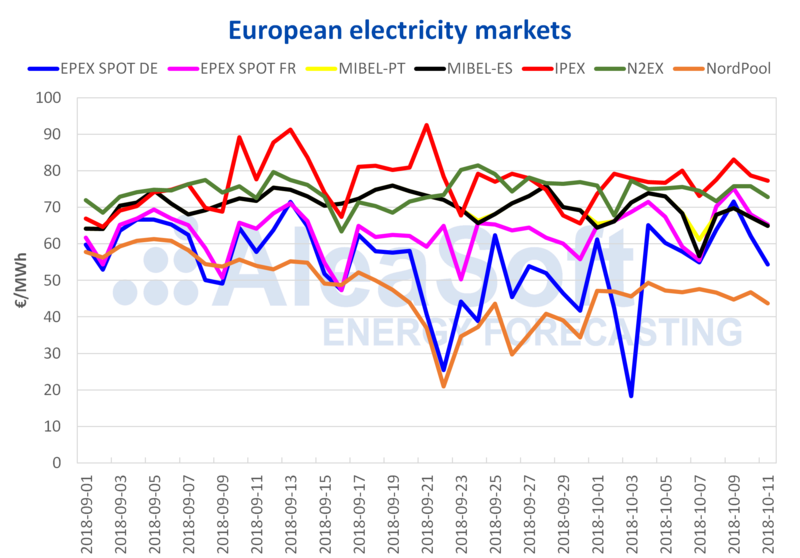 The biggest increase, of 13,98 €/MWh, occurred in the German market EPEX SPOT, that, according to AleaSoft‘s analysis, was due to an increase in the demand and a decrease of the wind energy production. In general, the prices of the main fuels for electricity generation have relaxed in the last seven days, since the session of October 3. The price of the Brent oil futures for December 2018 has been above 84 $/bbl this last week, except for a peak value of 85 $/bbl on October 9, but in the session of October 11 it fell down to 83,09 $/bbl. The price of the European API 2 coal futures for October 2018 has been oscillatingaround 100 $/t. In the case of gas futures for November 2018, the settlement price on October 10 was 0,89 €/MWh lower than on October 3. In the case of the futures of the CO2 emissions rights for December 2018, although it has been traded over 22 €/t in the last seven days, in the session of yesterday, October 10, settled at 19,46 €/t, 1,73 €/MWh lower than October 3. For next week, on October 15, AleaSoft estimates that temperatures in mainland Spain will fall compared to this week and that the demand will rise 3,4%, which will move prices upwards.